I ended up having an unexpected wash day over the weekend due to some wind and a kid with sand. So I didn't feel like being disciplined and do a full blown-out wash day and opted for a co-wash day instead. My relaxed hair at 13 weeks post and I are so glad that I did. I have to admit, no matter how quick I want my wash to be I can't bear to skip a pre-poo. I sectioned my hair off into five sections and an oil mix of sunflower and coconut oil. I detangled, put on a plastic cap and sat under my hooded dryer for 15 minutes. I then quickly went and applied a keratin conditioner on top of the heated oil, put back on my plastic cap, and sat under the dryer again for another 15 minutes. My hair felt great after rinsing. I used the Thermafuse HeatSmart Serum Condition for my co-wash and then followed up with a green tea rinse. After rinsing my hair with green tea I immediately applied Eden BodyWorks Jojoba Monoi Deep Conditioner left it for about 5 minutes and then rinsed with cool water. My hair was still feeling great - soft and strong. I t-shirt dried then applied Pantene Moisture Mist Detangler before working out any lingering tangles. Next, I mixed some of the Eden BodyWorks Coconut Shea Leave-in Conditioner with a little sunflower oil before applying it to my wet hair. I finished drying under my hooded drier with my new growth stretched. After my hair cooled for a few minutes, I cross wrapped it and got ready for bed. My hair was still a little damp, but it finished drying overnight. Since my hair seemed to like, not love, the Suave Natural Infusions Moisturizing Conditioner I opted to return to my trusted oil pre-poo. I'm so glad I did as my hair was moisturized and shiny and didn't seem to lack anything even though I rushed through the wash. In fact, I think this was probably the best wash day I've had in a while. The green tea rinses seem to be working as I'm noticing less and less shedding every wash day and if I detangle properly and keep my hair detangled between washes I don't have much shedding outside of a normal amount. What does a rushed wash day look like for you? Your hair is soooo shiny and healthy looking, love it! When I have a rushed wash day I just and blow dry it on cool and do a bun. 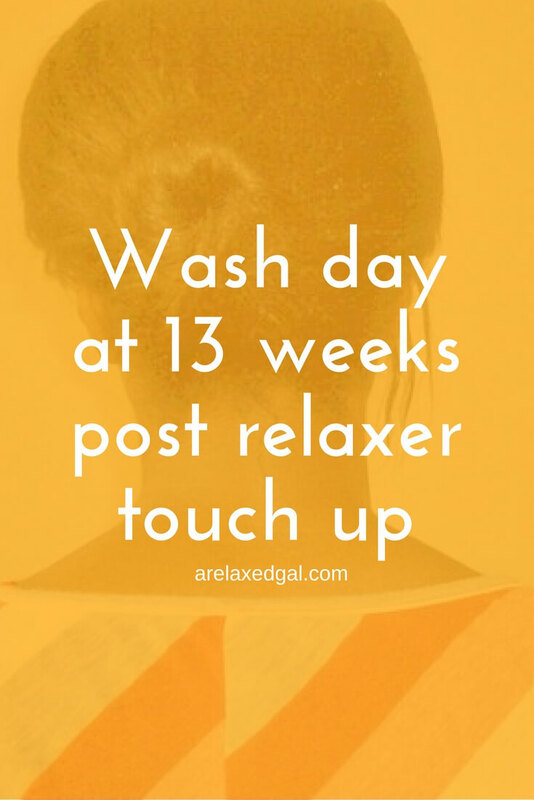 HOORAY for less shedding, soft hair, and quick #washdayexperiences! You're totally #winning chica! Congrats on a successful rushed wash day! I don't have terrible rush wash days, but mine still don't compare to my all day ones. :( I don't think I have ever mixed an oil with my leave in conditioner before. Sometimes I live under a rock. :) I'll have to try this! I started adding the oil to my leave in during my daily moisturizing because my hair wasn't always taking the application of first the moisturizer and then the oil to seal. So I started to mix them in my hand and then apply. So much better results for me and the moisture stays longer.